The engine line-up will be expanded later, but for now there are just two options: a 201bhp 2.0-litre four-cylinder diesel (illogically badged 40 TDI) and a 282bhp 3.0-litre six-cylinder diesel (50 TDI). The 50 TDI generates huge shove from relatively low revs and feels effortlessly quick much of the time. However, even in Dynamic mode, its eight-speed automatic gearbox can be a bit slow-witted when pulling out of junctions or if you suddenly ask it to kick down to a lower gear. However, the less expensive 40 TDI will be the more logical choice for most people; it offers lower fuel consumption and emissions, yet still has enough grunt to haul a fully loaded car with ease. A seven-speed automatic gearbox is standard with this engine, and while it can also leave you momentarily hanging when you’re looking to pull away swiftly from stationary, it’s fine on the move. There are four suspension options to choose from. Entry-level Sport trim gets standard steel springs and dampers, S line models get the same, but stiffened and lowered, and you can upgrade to an adaptive suspension system for a extra charge, which comes with switchable dampers that can be softened or stiffened to suit your mood. Adaptive air suspension is an even pricier option, but itn’t available on the lowest-powered 40 TDI. Both non-adaptive set-ups deliver a supple enough ride over large bumps, such as sleeping policemen, but even the softer ‘standard’ springs tend to thump over sharper-edged potholes and can see you being pitched forwards and backwards in your seat. We'd definitely recommend you opt for the adaptive dampers. They’re reasonably priced, are available even on the lowest-powered 40 TDI and, despite still being on the firm side, deliver a far more sophisticated balance between control and compliance. They also deal with broken stretches of asphalt more effectively and control body movements over dips and crests extremely well. 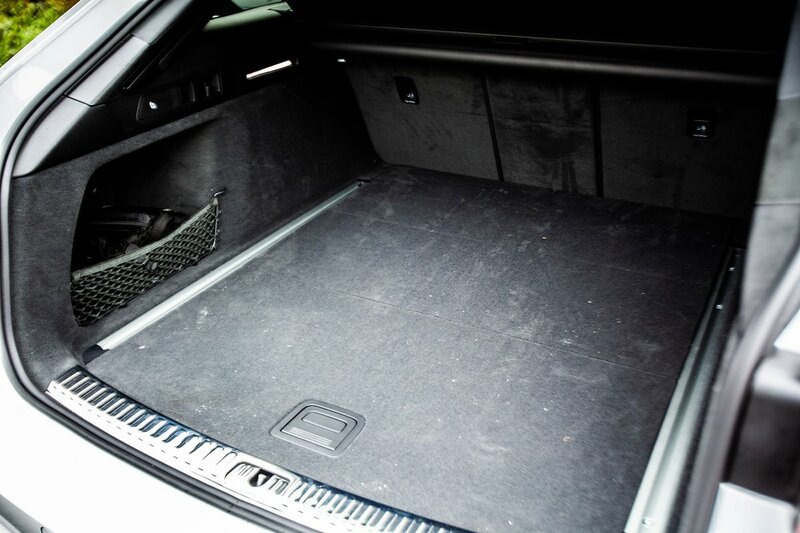 Those who regularly travel with the boot heavily loaded might be wise to consider a model that allows you to add the optional air suspension – It provides self-levelling to prevent heavy loads from causing the car to sag on its wheels. 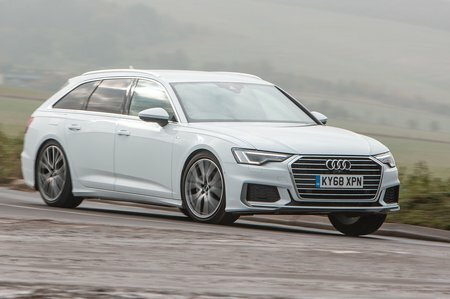 While the A6 Avant doesn’t scythe through bends with the precision of a Jaguar XF Sportbrake, it mostly handles predictably and securely. We say mostly, because how the 40 TDI sends all of its power to the front wheels is given away by a tendency for its steering wheel to tug unnaturally in your hands under hard acceleration. There are no such problems in the 50 TDI, which comes with Audi’s traction-enhancing quattro four-wheel drive system. Optional rear-wheel steering turns the rear wheels in the opposite direction to the fronts at low to medium speeds, which reduces the turning circle by more than a metre and makes the car change direction more eagerly. At higher speeds, it turns the rear wheels in the same direction as the fronts to enhance stability. Those engines also feature mild hybrid technology, where the energy that would normally be lost under braking is instead recycled to allow brief periods of engine-off coasting that conserves fuel and, of course, reduces engine noise. A bonus of this technology is how it makes the regular engine stop-start system smoother. 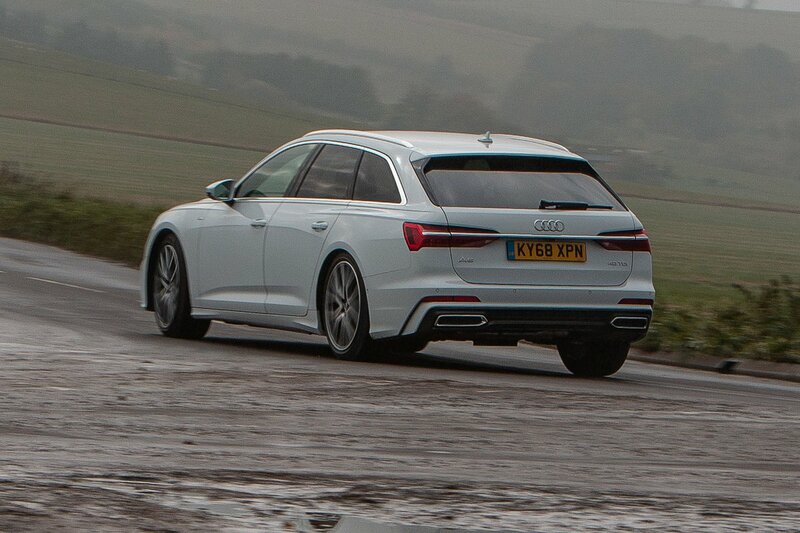 However, there are still a couple of areas of refinement where the A6 Avant fallls behind the BMW 5 Series Touring. When the car is in its most responsive Dynamic driving mode, the six-cylinder 3.0-litre diesel engine sounds coarser than you might expect when accelerating hard. With two fewer cylinders to share the workload, the 2.0-litre diesel sends some buzz back through the accelerator pedal. However, the latter engine is still smoother than its Jaguar and Volvo equivalents.